…and I decided to take a walk through my vegetable garden with the video camera, and also post the video here. Welcome to the food growing section of the Academy! Actually, the whole Academy is kind of a food growing thing but this module, all these modules here are going to be specifically about growing food and if you’re in the Academy you always know that I do this little intro video here at the beginning of every section. But what I’m going to do today is go for a little walk through and around my home vegetable garden and show some of the organic plants I’m growing and I’m going to post it on my blog too, because I figure maybe somebody there is interested to see that. So what I have behind me here is this little organic garden that I put in last year, this is only the second year so it’s not super productive yet. The soil still needs some improving. It takes a number of years to get to – it can take a decade to get to being highly productive. But, already growing lots of organic food in year two and this organic vegetable garden is going to evolve but it’s not going to become the garden of my dreams because this isn’t at my place. I don’t live here, I don’t spend a lot of time here so I had to install an organic garden that was pretty easy for me to maintain if I’m just showing up once a month to make sure everything was in check. And, also, it’s at my parents place so eventually I’ll want them to be able to maintain it. So, it’s kind of too bad that I can’t show you everything that I would want to do in my home vegetable garden but I get to show you pretty much everything and, what I think is pretty cool is that I get to show you how much food you can get out of a pretty small garden. This is less than 1000 squared feet and we have a lot of different crops coming out of here. So I’m just going to take a quick walk through. If you’re already growing a bunch of organic food this is not going to be a big deal to you because you already know what these things look like but I’ll just share a few principles while I walk through here. Just give me a second to get the camera off here. …So here we go. So, I’m just going to start talking about whatever I run into here. Tomatoes are obviously everyone’s favorite crop. I hope you guys know – if you don’t know – these little tomato cages are not very useful. The only time I really use them is when I have too many tomatoes for my trellises, which work much better. You can see I’ve already had to tie this one up because they always flop over. The tomatoes get too big for them. They can be maybe useful for determinate tomatoes but mostly I don’t recommend them. So, let’s see here. You’re going to notice things like dill and basil and parsley and all kinds of herbs and alliums all throughout these home vegetable gardens. I plant them liberally. Even you’ll notice in my corn back here, which is quite a nice happy corn patch, I don’t know if you can see into the shadows but there are dozens of native plants in there, wild flowers. And perhaps that in theory is going to diminish my corn yield but its really making a wonderful ecosystem in there, a lot of biodiversity in there, a lot of things like to get in there. I have a few beans climbing up the corn stalks, I don’t know if you can see them. There’s a cucumber that is starting to grow up. There’s a purple basil. I even leave some cover crops growing. Mostly I take them out, but I leave a little bit for diversity. So I have some clover, that I just keep on the border here along with a rye grass, just a little bit of rye. Then it comes into a vetch which is another legume, along with an annual ryegrass that looked really good. Now it has fallen over but it’s still kind of cool and rustic and provides homes for some insects I’m sure. Then it’s going to come back into clover there with the rye and back into some oats and clover and again some vetch. So I have lots of different covers going on. We’ve had a lot of cherry tomatoes in the last two weeks and now the bigger tomatoes have been coming on, just starting, mostly still green but harvesting a few red, big tomatoes. You know you can see there’s my parsley in there, there’s a basil in here or basil however you want to say it. I have them all over the place. Squash is coming up on my trellis here, too. I kind of have a little bit of a modern version of the three sisters, I do plant a traditional nice patch of corn but I put some squash along the edges of it and some beans along the edges of it. That’s a little black bean – a bush bean – down there but there are a few beans climbing up through the corn, too. Using the corn as a trellis. I’ve started harvesting potatoes and shallots. There’s a few, a small radish patch left over and a few beets in there. Rudbeckia is nice. Leaning a little bit towards the sun right now but he’s pretty happy and the echinacea is beautiful lots of butterflies on him this time of year (or her). I have basil all over this home vegetable garden. There’s a purple, there’s kind of a small leaf basil and more regular big leafed basil. I probably have 50 basil plants. There’s some parsley. A lot of my parsley went to seed this year. It’s a biennial, so in year two it goes to seed and starts to taste a little tough but fortunately I have some new ones around. There’s some thyme, some tarragon, lots of dill around the herb garden. More thyme. Garlic patch ready to be harvested. This is one of my garlic patches. There’s a volunteer squash which really shouldn’t have volunteered because it never went anywhere. Now we come over to the sheet mulch section of my small vegetable garden that whenever I put in a new bed I usually sheet mulch it for the first year. It’s usually not quite as productive which really is the case here but it still does okay. My peppers are a little behind but they’re coming on. Baby pepper! I’ve got lots of beans all around the home vegetable garden. These one’s are really cool they’re a purple bean but if you’ve ever used them before you’ll know they turn green as soon as you cook them. Again, there’s some yellow baby tomatoes. Lot’s of other tomatoes and beans climbing up my trellis here. Some squash. Really this is a zucchini, like a crook-neck zucchini. It looks kind of like a winter squash, but it’s really tasty. You just eat it, don’t need to cook it or anything. I have some ornamental plants throughout the organic garden, too. I would never advise anyone to plant a burning bush especially as a standard but it is quite nice in the fall, and in the spring. More squash back here climbing up. Lots of parsley and basil in there, more purple beans. Beans and squash climbing up here. Some raspberries in here that I planted this year. I have to remember to get this garlic out. Then we have a locust providing a little shade for the strawberry patch which is always producing a few berries here and there. Ever-bearing, as they say. Lemon balm in here. We get into the herb part, the kind of main herb part of the organic vegetable garden. Lemon balm, a mint, sage, oregano. There’s a container. Another oregano, some chives hiding in there. Let’s see, I have more parsley and dill gone to seed, cilantro gone to seed. There’s kind of a lemony thyme, another garlic patch that’s in need of harvest and it’s going to flower. Flat-leafed parsley, cabbage. Another mint family, I guess maybe oregano. This is called whore-hound. This is the stuff they used to make candy, hard candies out of. I don’t know if they still do. It’s kind of a variegated little thyme there. Here is my mesclun mix and if you guys have ever grown mesclun mix you know that you’ll often get all the lettuces out and everything is left there. What I usually prefer to do is make my own mix, then I can sow a lot more lettuce. So we have arugula and a bunch of other various greens in here that are starting to go to seed and getting a little bitter so I’m going to have to clear this all out and plant something more appropriate in there for mid summer. Let’s see, more regular yellow zucchini and some cucumbers in here. More dill. 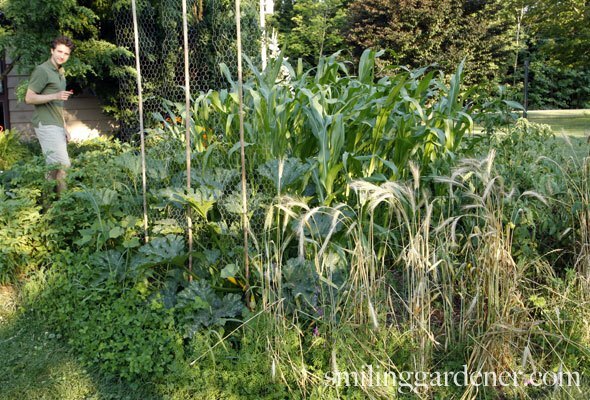 We eat a lot of herbs and greens so that makes up a lot of this backyard vegetable garden. We have some more basil and parsley, a few lingering brassicas, a few broccoli that are perhaps not so happy with this heat. Potato patch. I have a few of those around. I have a mint confined to this pot with a little bit of lavender and kale. A butterfly bush that is covered with butterflies, but really is not the most appropriate plant for most of North America. It’s not native to most of here so butterflies will come and eat the pollen but they are not going to lay their eggs. There are a lot better plants to put in your garden so do as I say, not as I do, as they say. Actually, there’s a butterfly weed back in there that is native so that’s a little bit more appropriate. Here’s a raised bed vegetable garden that I put in this summer that I’m going to plant in the fall. It’s just sheet mulched now. Now you can see we kind of have some ornamentals throughout too. There’s a really beautiful redbud in the background. I had over here is more of an ornamental garden that was a huge kale forest I just harvested. That’s why the soil’s bare now. So, ya, there’s my organic garden. I’ve kind of just rambled through there listing a bunch of organic plants but really with all the herbs and greens there’s probably 40+ kinds of plants in there. Various, not right now peas but certainly a lot of different kinds of peas and beans. Bush beans, pole beans, scarlet runners, some dry beans. All the solanums, so potatoes, peppers, tomatoes, different squashes, cucumbers, melons. What other families? Carrots, there’s carrots buried in here and a lot of the carrot herbs so the celery behind me, dill, parsley. Obviously lots of onions throughout here so garlic, shallots, onions. What other families do we have here? All the various kinds of greens, all the herbs, the mints, the corn is a grass. What else? Probably more. Oh yes, certainly your beet family with your chard and your beets, your brassica family with your cauliflower and your broccoli and your kale and radish so you can see there are many vegetables you can get out of a small space. Even if you only have a couple hundred square feet you can grow a lot of organic food in there. So, normally my introduction in the Academy is just a couple minutes long. But what we’re going to be getting into today for Academy members is I’m going to go over how to grow a bunch of different kinds of organic plants. Perhaps not everything I mentioned today, but a number of different kinds of plants. And, get into starting a vegetable garden, companion planting a vegetable garden, winter cropping, succession planting, crop rotations, polycultures, preparing the design of your bed. Eventually, I’ll get into all the harvesting, storing, preserving, canning, saving seed all that kind of stuff. And then I’m going to do a whole other organic food module, too where I get into making that raised bed over there, winter gardening, indoor vegetable gardening, organic container gardening, building trellises, building cold houses. A lot of stuff! Pretty fun for me and I hope it’s fun for you! So, we’ll see you soon. Who’s vegetable garden is it yours or your Mom and Dads? Strawberry’s growing in the shade? Hmmmm. Man you are full of it. Thanks for your comment. I installed the garden at my parents’ place since I don’t own a house, and tend to move around a bit. Strawberries do extremely well in light shade. Mine are partially in full sun, but they’ve migrated under the tree and are producing just as well under there. Brian, seems you are trolling however I’ve had great strawberries growing in near fully shaded area. Like your strawberries that aren’t suited to shade your comment is not suited to the nature of this website. Cheers Ben. That is cute that your strawberries had the freedom of choice and picked a little shade. I so enjoyed your walk-around. I also want to make sure I am in the academy. You have many great new items in gardening that I as an experienced gardener have learned from you. Do show us about seed saving too. Thanks Phil, R.J. Thanks Phil, I have learnt many news things, plus the information has reinforced my Yukon Master Gardener course material. This year was more about learning the terms of organic gardening. Collecting material for composting, planning out what next summer’s garden plot will look like. What will grow well or maybe not.Planted flowers from seeds, lettuce, spinach, chives, thyme, savory. Just a small sample in containers.Plus spreading the word to other members of my small northern community, about composting, clearing, building garden boxes etc.Thank you for sharing and assisting in getting my organic gardening slowly off the ground or should I say back to the ground. Very glad to pitch in Audrey! I’ve done plenty of research and you, Phil, are my go to organic gardener expert. Thank you for your knowledge!